Go "green" with fabrics made from natural, earth friendly bamboo. Earth Friendly. The fabric is woven from a very renewable resource and is fully bio-degradable. Cooler and drier than Cotton. The fibers in Bamboo wick away moisture up to nine times faster than cotton, making this the perfect fabric for people who experience hot flashes or who tend to perspire in their sleep. Naturally Anti-microbial. Bamboo fibers kill bacteria, fungus, and microbes, which in turn keeps them virtually odor free between washing. Enjoy a cleaner, healthier sheet. Silky soft texture. 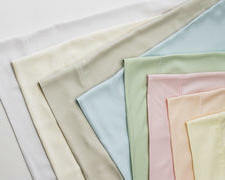 Similar to rayon or silk in feel, bamboo has been compared to the highest thread count cotton textiles.